Chinese smartphone player Xiaomi has announced the launch of two new smartphones in the Indian market. Chinese smartphone player Xiaomi has announced the launch of two new smartphones in the Indian market. 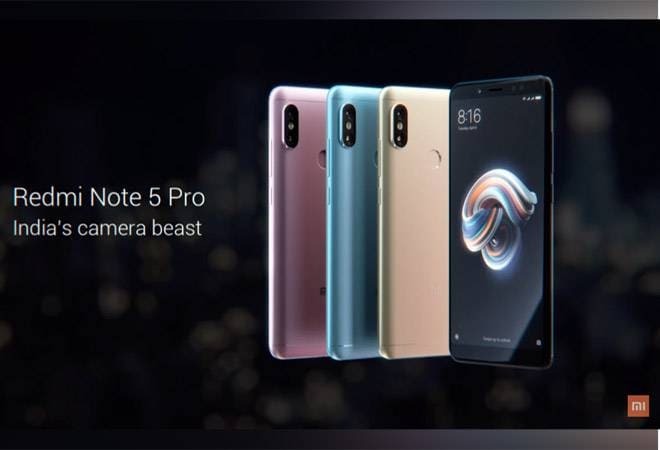 After selling 9.6 million Redmi Note 4 smartphones in 2017, Xiaomi has now launched the Redmi Note 5 and Redmi Note 5 Pro. Claiming it to be the all-around upgrade to the Redmi Note 4, the Redmi Note 5 has received design, camera and quality upgrades. With the reduced borders on the top and the bottom, the Note 5 features a 5.99inch 18:9 display with 2160x1080 p resolution and Gorilla Glass protection in the similar form factor. It has a premium metal body with tapered back cover. The device is 8.05mm thin and continues to have the same 4,000 mAh battery. Improving camera, the Redmi Note 5 has a 12 MP main camera with an upgraded sensor that can capture better low light images. The 5MP front camera features LED selfie-light and beautify 3.0. Improvising the hardware quality, Xiaomi is using dual pyrolytic graphite sheet that decreases the temperature by 2 degree C. The device comes with customised power adapter for India that can withstand voltage surges up to 380V. However, it continues to feature the Snapdragon 625 processor and will be available in two variants - 3GB RAM + 32GB storage and 4GB RAM and 64GB storage. The former has been priced at Rs 9,999 whereas the latter will be available for Rs 11,999. Announcing the global debut of the Redmi Note 5 Pro, it is the first phone to feature Qualcomm Snapdragon 636 processor. Using Kyro 260 CPU, this processor is claimed to offer up to 50 per cent higher performance, up to 40 per cent more power efficiency with sustained performance. It runs Mi UI 9 based on Android N. Claiming it to be the fastest Redmi Note phone ever, the Redmi Note 5 Pro has managed a score of 109692 on Antutu benchmarks. Even the Redmi Note 5 Pro features a 5.99inch 18:9 display with tapered rear. Xiaomi has added a vertical dual camera at the rear with a 5MP Samsung sensor + 12MP Sony IMX 486 sensor for capturing depth images. Xiaomi has also added electronic image stabilisation for capturing videos. The company has also used artificial intelligence based computing engine for capturing better images that captures portrait selfies with a single camera. It has a 20MP Sony IMX 376 sensor with LED selfie-light for capturing better low-light selfies. Xiaomi has also added a Face Unlock feature to the Note 5 Pro, which will be added with an over-the-air update. The phone continues to have a 4000 mAh battery, is 8.05 mm thin and weights 181 grams. The Redmi note 5 Pro will be available in two variants - 4GB RAM + 64GB storage for Rs 13,999 and 6GB RAM + 64GBb storage for Rs 16,999. Xiaomi has been getting really aggressive in the Indian market. According to the latest IDC report, Xiaomi has 26.8 per cent market share in Q4, 2017 in the Indian market. Xiaomi has become the fourth largest brand in the world, after Apple, Samsung and Huawei.